"I'm content with 90 percent of me. I like my teeth. Sometimes I wonder if my orthodontist realized how important he was." I have thought about this so much. As my kids grow older and I try to impart the value of good hygiene, I realize more and more how thankful I am for my teeth. My smile. It's not perfect. But, do my parents know how grateful I am that they paid for me to have braces... sans insurance? I smile. A lot. On Sunday my face actually hurt because I smiled so much. I just can't help it! We think about our clothes, our shoes, our accessories, our hair. But so often we neglect one of the most important... possibly THE most important... fashion features we all have. Our smile. Now, I have friends who are embarrassed to smile because they're teeth aren't what they wish they were. A little crooked, not symmetrical, they're self-conscious about their gums showing. You know what? A smile is the most beautiful thing you can put on. No one wants to be the stern, rigid Victoria Beckham and come across as a sour puss. (Sorry, Vickie. I know we're tight and all.) SHE actually doesn't even want to be the person she's put forth: "I think they have this impression that I'm this miserable cow who doesn't smile. But I'm actually quite the opposite. ... I'm going to try and smile more for America." *If you've neglected them a little, buy an over-the-counter whitener. It only takes a few days, and you'll be able to truly flash pearly whites. You don't need to pursue expensive veneers and professional whiting. A $30 kit will do the trick. Just don't get them TOO white. They'll look scary. *Blue-based lipsticks will make your teeth appear whiter. Oranges will have the opposite effect. Not a lipstick girl? Just dab on some tinted gloss and go. *Toss some floss in your purse. You never know when something will be stuck. In a pinch, use the back of your earring to fish out that leftover spinach. *It doesn't matter if they're not what you consider "perfect." Everyone is unique and beautiful in they're own right! Smile anyway. And SMILE BIG! Smile with your eyes. Let your soul shine through. Take it from Annie. It completes the outfit. 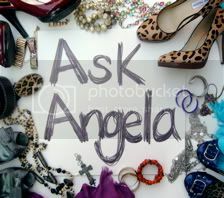 Love this post.One of my favorites from you, Angela! The pajama get-up has got ot be my all time favorite. Um, tangent. Sorry. A smile is the easiest fashion accessory to apply. You can't mess it up!